2017 began as most years do, the Bermuda high slid east across the Atlantic Ocean and the cold fronts began to reach the Gulf Coast. However, this past winter was milder than normal. Either the high did not slide as far east as it typically does, or the fronts did not pack the punch they normally do – but we did not have as many deep freezes in 2017. That’s how it began. The Bermuda High influences both our weather and climate in the Florida panhandle. 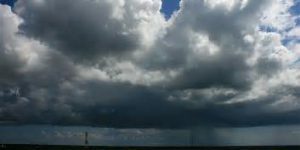 As spring approached the Bermuda High made its’ annual move westward, bringing us the clockwise winds from the southeast and moisture from the Gulf. It was time for rain… and rain it did. It rained and rained and rained. It rained so much that the salinities in the local bayous in Pensacola, which typically run between 10-15 parts per thousands, were below 1 ppt – freshwater. These heavy rains triggered high bacteria counts in the water column, which triggered health advisories – increasing 139% this year. Communities calling about snake encounters – this is not unusual when it rains, but this year there were more venomous snakes than we typically see. We began to get calls concerning Cuban Anoles (an invasive lizard) all along the coast from Perdido Key to Gulf Breeze. As more people searched, more anoles were found. I saw the first two at my house this year. We were searching for horseshoe crabs, and found them! In several locations in the lower bay, but never found where they were nesting – we will continue to search in 2018. Our terrapin surveys extended to Walton County. We found two new terrapin nesting beaches in Escambia and the sea turtle nests reached record numbers across the state. Our scallop surveys in Santa Rosa Sound and Big Lagoon were a complete bust due to the rain. Either it was raining, or the visibility was so poor you could not see. An algal bloom occurred in St. Joe Bay that closed scalloping for most of the season. We began a seagrass monitoring project with the University of West Florida. This was a tough year to begin due to the poor visibility, but we will continue in 2018. 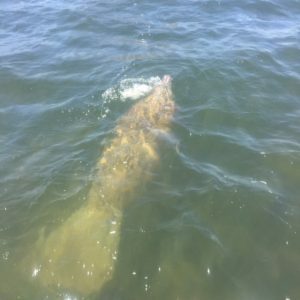 Manatee sightings were reported in Big Lagoon and Santa Rosa Sound. Again, this is not that unusual but the number of sightings, the number of manatees together, and the length of time they remained in the bay were. And then the mangroves – nine red mangroves were reported in Big Lagoon. Sea Grant will be working with Dauphin Island Sea Lab and resource managers from NERRS in Florida, Alabama and Mississippi to search for more mangroves in the northern Gulf in 2018. Rain storms are common when the Bermuda High is in the western Atlantic. 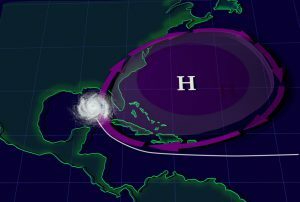 As summer moves into fall the Bermuda High typically begins to slide eastward, taking with it the “protection” from summer hurricanes – and the hurricanes came. First, it was Harvey, then Irma, then Maria, and then Nate. All had their impacts on the area. First were the flamingos in Pensacola, three of them, photographed in different locations around the bay – then they were gone. Numerous flocks of white pelicans. They typically fly through the area but there appeared to be more than we normally see and reports of them landing across the area increased. We received calls about “invasive” plants growing in the bayou – which turned out to be freshwater plants that had taken advantage of the freshwater conditions in our bayous from the heavy rains. How did this season fare with local seafood (Escambia County only)? And an 11% decrease in the price/lb. fishers received for their seafood – from $2.20/lb. to $1.95/lb. But there was a 33% increase in the pounds of seafood reported – from 839,673 to 1,121,225 lbs. And a 25% increase in the estimated value of the local seafood harvest – from $1,589,518 to $1,991,286 – vermillion snapper, red snapper, and striped mullet remain our top three target species. Manatee swimming in Big Lagoon near Pensacola. We are now moving into winter. The Bermuda High has moved across the Atlantic. This typically begins a dry season – and it has been dry for several weeks. It also allows cold fronts to reach the coast – and they did. On December 9, it snowed in Pensacola. Who knows what 2018 will bring but we will continue to be in the field monitoring and observing. There are opportunities for locals to volunteer for some of our monitoring projects, and there are other agencies and NGOs in the area seeking volunteers for monitoring and restoration projects. Join us if you like, and have a very happy holiday season. According to Druid lore, hanging the plant in homes would bring good luck and protection. 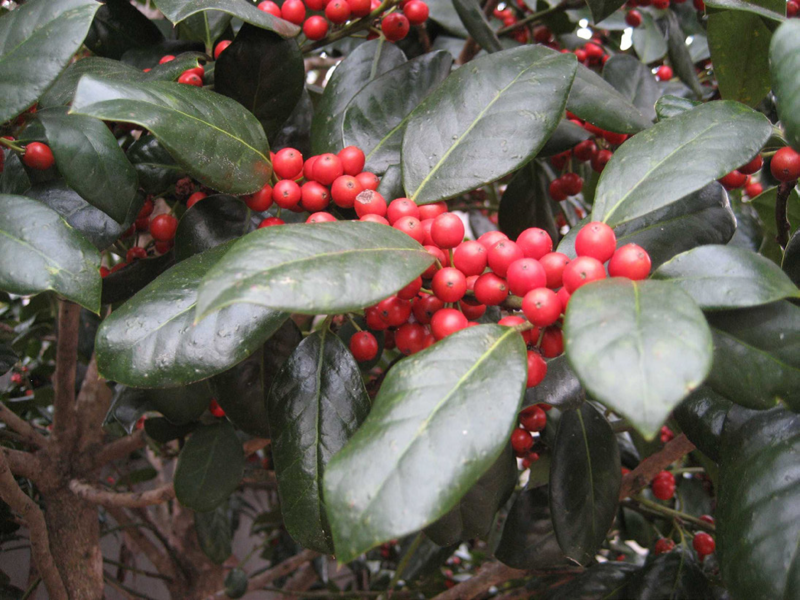 Holly was considered sacred because it remained green and strong with brightly colored red berries no matter how harsh the winter. Most other plants would wilt and die. Later, Christians adopted the holly tradition from Druid practices and developed symbolism to reflect Christian beliefs. Today, the red berries are said to represent the blood that Jesus shed on the cross when he was crucified. Additionally, the pointed leaves of the holly symbolize the crown of thorns Jesus wore on his head. Several hollies are native to Florida. Many more are cultivated varieties commonly used as landscape plants. Hollies (Ilex spp.) are generally low maintenance plants that come in a diversity of sizes, forms and textures, ranging from large trees to dwarf shrubs. The berries provide a valuable winter food source for migratory birds. However, the berries only form on female plants. Hollies are dioecious plants, meaning male and female flowers are located on separate plants. Both male and female hollies produce small white blooms in the spring. Bees are the primary pollinators, carrying pollen from the male hollies 1.5 to 2 miles, so it is not necessary to have a male plant in the same landscape. Several male hollies are grown for their compact formal shape and interesting new foliage color. Dwarf Yaupon Hollies (Ilex vomitoria ‘Shillings’ and ‘Bordeaux’) form symmetrical spheres without extensive pruning. ‘Bordeaux’ Yaupon has maroon-colored new growth. Neither cultivar has berries. Hollies prefer to grow in partial shade but will do well in full sun if provided adequate irrigation. Most species prefer well-drained, slightly acidic soils. However, Dahoon holly (Ilex cassine) and Gallberry (Ilex glabra) naturally occurs in wetland areas and can be planted on wetter sites. Evergreen trees retain leaves throughout the year and provide wind protection. 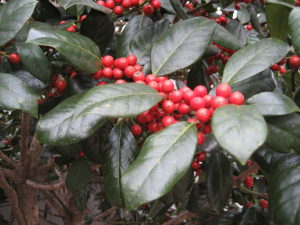 The choice of one type of holly or another will largely depend on prevailing environmental conditions and windbreak purposes. If, for example, winds associated with storms or natural climatic variability occur in winter, then a larger leaved plant might be required. The natives are likely to be better adapted to local climate, soil, pest and disease conditions and over a broader range of conditions. Nevertheless, non-natives may be desirable for many attributes such as height, growth rate and texture but should not reproduce and spread beyond the area planted or they may become problematic because of invasiveness. There is increasing awareness of invasiveness, i.e., the potential for an introduced species to establish itself or become “naturalized” in an ecological community and even become a dominant plant that replaces native species. Tree and shrub species can become invasive if they aggressively proliferate beyond the windbreak. 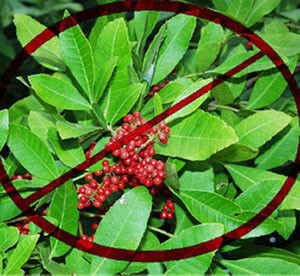 At first glance, Brazilian pepper (Schinus terebinthifolius), a fast-growing, non-native shrub that has a dense crown, might be considered an appropriate red berry producing species. However, it readily spreads seed disbursed by birds and has invaded many natural ecosystems. Therefore, the Florida Department of Environmental Protection has declared it illegal to plant this tree in Florida without a special permit. Consult the Florida Exotic Pest Plant Council’s Web page (www.fleppc.org) for a list of prohibited species in Florida. The observations I made of rattlesnakes is just that… observations, there is no scientific study I am aware that supports what I appear to have seen, but I have noticed it – more than once now. The eastern diamondback rattlesnake (Crotalus adamanteus) is a legendary animal in the southeast United States. William Bartram mentions it several times during his travels through Florida in the 1770’s. His Florida nickname “Pug Puggy” actually came from an incident where he killed a large one in a garden of a Seminole camp. Almost every story about the colonial/settling period of state, whether fiction or non-fiction, includes this snake. They are the largest venomous snake in the U.S., reaching up to six feet, and can have the girth of a man’s arm. They have a large head, holding large venom glands, and have a strike range of 33% their body length – the stuff of legends. However, few people of died from this animal. One website list 53 fatal snakebites in the United States since 1900, 11 are listed “prior to 1900”. Of the 53 snakebites, 34 (64%) were from rattlesnakes – all 11 (100%) of the “prior to 1900” were rattlesnakes. However, there are a reported 16 species of rattlesnakes in the U.S., only three live in the southeast. From this list, there are only three confirmed Eastern Diamondback bites (5%), and an additional 7 that “may” have been. They were identified as rattlesnakes and the victims lived in the southeast, but the bite could have been from the timber or pygmy rattlesnake. The vast majority of lethal rattlesnake bites come from out west. 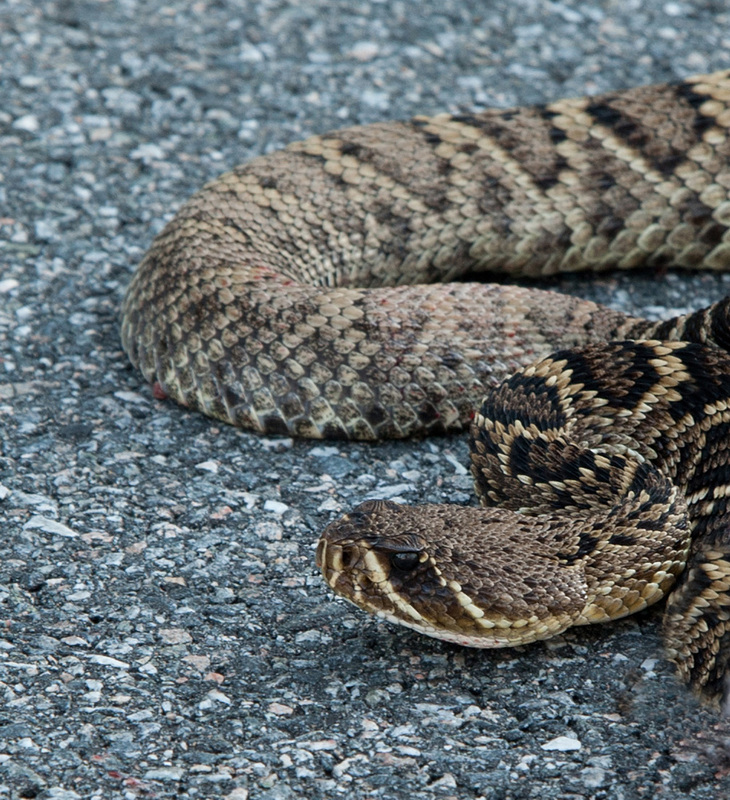 Granted, in the early part of our state’s history many rattlesnake bites went unreported, however 3 confirmed deaths (10 possible) since we became a state is not that many when compared to the number of Floridians who have died in automobile accidents or violent crimes. That said, this is still a legendary animal that many fear, and the snake lives on Pensacola Beach. 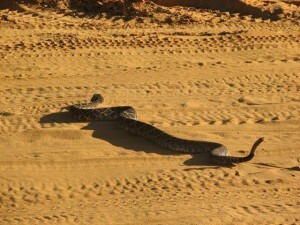 In the past month, I have received several photographs of the eastern diamondback seen in the National Seashore. The observation – they seem to be more common when we are not around. No doubt, they were probably once common on the island. Many are surprised by this because the only way to access Santa Rosa Island, initially, was to swim – but rattlesnakes are good swimmers. They do not prefer the water, but have no problem crossing it. They are primarily consumers of rodents, taken prey as large as rabbits if they can, and hunt primarily at night – so viewing during the day is not common. However, when the road to Pickens was closed after Hurricane Ivan, daytime encounters with eastern diamondbacks increased. There were numerous reports of individuals seeing them moving around the park. Then the road re-opened, and no one saw them anymore. Hurricane Nate caused enough damage that the park, once again, had to close for repairs – and the photos began to come in. It will be interesting to see if the number of encounters begins to decline no that it has re-opened. Are these snakes aware of our presence and seek refuge? It would be nice to know they did, but both Ivan and Nate arrived in the fall when rattlesnakes begin to move for breeding. How many of these snakes would be seen whether the road was open or not. I know when the road is open I do not hear as much from the public. I also know that recently FWC was requesting reports of encounters with this snake because they feared it was declining across the state. Along with several other species of local snakes – such as the Southern Hognose (Heterodon simus) and the Florida Pine Snake (Pituophis melanolucas migitus), they were asking the public to report sightings. They recent removed the eastern diamondback from this list – suggesting that encounters were more common than they thought. Again, maybe a case of “I’m here but I’m hiding”. The familiar face of an Eastern Diamondback Rattlesnake. For me, it is an interesting observation. I find the animal fascinating, maybe because of its legendary status and rare encounters, but I find it fascinating nonetheless. I certainly understand the safety concerns with having this animal so close to us, but the records of bites and fatalities suggests the threat is not as large as we perceive it. I would certainly recommend homeowners maintain their property as to reduce the risk of an encounter, but know most do – or else you would be seeing more of them. As with sharks, I for one am glad to know they are still around. A great walk or ride is close at hand on this trail which once supported a critical 19th century transportation link. The typical image of a state park is that of a place where visitors enter through a front gate and enjoy the wonders of nature or some historic structure. The Tallahassee-St. Marks Historic Railroad State Trail, which is run by The Florida Division of Recreation and Parks, is truly an exception to the typical model. While many parks have trails, this one runs 20.5 miles from Tallahassee to the coastal community of St. Marks. 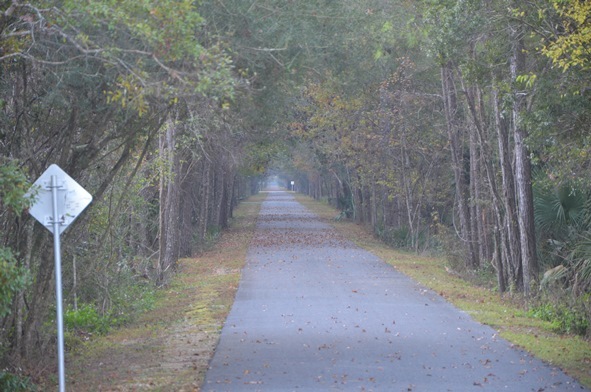 This area is the first rail-trail in the Florida’s system of greenways and trails to be paved providing a scenic experience for running, walking, bicycling and skating. Additionally, horseback riding occurs on the adjacent unpaved trail. Because of its outstanding qualities, this state trail has been selected as a National Recreation Trail. The origins of this 21st century recreational site date back to before Florida was a state. The Tallahassee Railroad Company was approved in 1835 by the territorial legislative council and received the first federal land grant to a railroad for construction of the line. Cotton and other commodities moved from the Tallahassee region to the port of St. Marks for shipment to the north east U.S. and to Great Brittan. Raw cotton was the major generator of foreign exchange during the antebellum years, so this railroad was a critical economic link in the area’s development. Fast forward to 1983, that is when the Seaboard Coastline filed the papers to abandon the line and end service. After 147 years, the longest-operating railroad in Florida was deemed economically unfeasible to operate. It was not out of service for long. In 1984 the corridor was purchased by the Florida Department of Transportation, and the rest is history. Visitors can access the trail in multiple locations along the way. Parking areas are provided at many locations along the trail with mileage markers make available distance information and the trail corridor is lined with trees providing plenty of shade. Restroom facilities are placed at intervals along the trail. There are picnic pavilions and a playground at the Wakulla Station Trailhead. The trail is open from 8:00 a.m. until sundown, 365 days a year and there is no use fee required. Donations which aid with the promotion and upkeep are accepted. For more information on the St. Marks Trail, contact the park office at (850) 487-7989 or Tallahassee-St. Marks Historic Railroad State Trail. While the historic structures are gone, it is a great way to enjoy nature’s wonders close to the coast.